Wylene01359 271130work Self-cateringThis pleasant, spacious bungalow is on the eastern outskirts of Great Barton village. It is 4 miles east of historic Bury St Edmunds; famous for its twice weekly street market and the Cathedral's new tower. Wylene is situated about 300 yards off the A143 and 3 miles from the A14, so you will find it an excellent base for exploring East Anglia (UK's driest area). Ideal for country lovers, walking and cycling; it takes about one hour to drive to the coast. Accommodation is all ground floor, suitable for older and less mobile guests, part-time wheelchair users (mobility level 2) and hearing impaired (level 1). Linen, towels and power included in the price with wireless internet access at no extra charge. Spacious lounge with DVD player and widescreen freeview TV. Large kitchen with electric oven, gas hob, microwave, fridge, freezer, dishwasher, radio and coffee maker. Step down into the large conservatory set as dining area (ramp provided). Bedroom 2: twin beds and en-suite shower room. Bedroom 4: king size bed and en-suite shower room. Family bathroom with "whirlpool" bath and large low shower cubicle. Patio, barbeque and garden furniture. Large enclosed garden with sunny and shaded areas to relax or play. Garage and off road parking for up to 4 vehicles. Filling station / convenience store ½ mile. Wylene offers weekly bookings starting on Friday and sometimes short breaks. Comfortable, spacious bungalow fully equipped for 8 people. Ideally situated for exploring East Anglia. 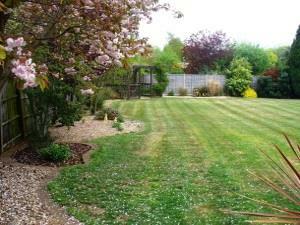 Large garden to relax or play. Cycle storage available. There is a pub nearby which serves meals. Leisure facilities in Bury St Edmunds 4 miles away. Children welcome from any age. VARIOUS AIDS AVAILABLE eg. Perching stool, Toilet seat raiser, Vibrating alarm clock, Large magnifying glass, Bell, Kitchen gadget - opener, Big handles on kitchen tools, Carver dining chairs, Low coat hooks, Low rails in wardrobe.